Music for 5 or More Celli : Gabrieli: Sonata Pian e Forte for Eight Celli. Gabrieli: Sonata Pian e Forte for Eight Celli. 8 Celli. This famous work for two opposing brass choirs is very effective for a cello octet or cello orchestra. It provides material for performance by a group of cellists with varying abilities with several parts in treble clef and most of the rest in bass clef. 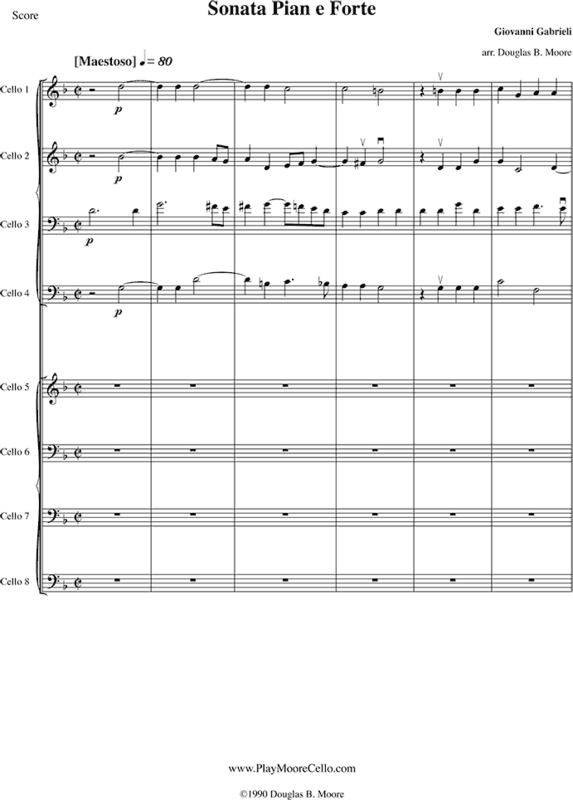 This arrangement was played by the cello orchestra at the 1996 American Cello Congress in Tempe, AZ. Score and 8 parts. Ideal for group with varying capabilities. This arrangement has been played all over the world; there is a YouTube video of the ten cello UMSL Cello Choir. Recording is of a student cello orchestra, near the end of the work.